Ever wondered why an ice cream box frozen at subzero conditions goes stale and begins to smell bad? It’s actually the presence of anaerobes that thrive even at -2°C. Micro-organisms can be present at extreme temperatures: At -2 °C, and also at 122 °C. Composting is a highly intricate process. The standard procedure takes anything between 30-45 days depending on the accelerators involved. A whole lot of work has to be done by different strains of bacteria and fungi to transform the organic material into compost. Although reams can be written about this beautiful process without which life is impossible on this planet, here’s just the gist of it. Psychrophilic stage: Temperature, about 12 °C. Psychrophiles digest carbon compounds, where carbon is literally burned or oxidised. Mesophilic stage: Mesophiles are comfortable at 21-32 °C just as human beings are. But this temperature is not enough to kill pathogens and weed seeds. Thermophilic stage: When thermophiles take over, they raise the temperature up to 71 °C where it usually stabilises. This is when most of the pathogens and weed seeds are destroyed. If the pile becomes cool, we should not mistake it for the completion of the process. It doesn’t mean composting has stopped. It actually means the thermophiles have gone and the mesophiles have come back. You have to turn the pile and mix up the uncomposted organic material lying on the fringes with the one in the centre to build up the heat again. It needs new material and turning to dial up the heat. And then we have extremophiles. As the name suggests, they survive in extreme situations. These specialist microbes manage without air and can be present even at 122 °C. Only when all the food (carbon and nitrogen) has been composted, the bacteria die. But the enzymes they produce keep on breaking down cellulose and lignin later on. They help fungi and actinomycetes which are nothing but half-breed organisms—part bacteria, part fungus—to thrive. These organisms love medium temperatures and moderate heat zones. When the pile is hot at the centre, they move to the outer fringes. They keep on breaking cellulose, starches, proteins and lignin—the toughest things. It’s actually the actinomycetes that give the pleasing earthy smell to the compost. As you can see, composting happens in stages and each strain of bacteria and fungi enter the pile at certain temperatures. But the presence of each one of them is necessary to break down a certain type of organic material. Typically, composting takes 30-35 days to happen. If you add accelerators, 20-25 days are enough to get that earthy smell. In our community, we generally store the compost for a couple of weeks before using. There are times when we use it immediately after it is sieved. It is okay to store it for a few weeks but better not leave it for months. Without new food, the micro-organisms perish—rendering all your efforts inconsequential. I have heard it from many compost-enthusiasts that once they start composting, they just can’t let go of it. On the contrary, you may come across naysayers who may pooh-pooh your love for composting. Just remind them that growth is just one side of the coin. The other side is decay. And this is what we are trying to achieve in a controlled environment. And the output is called compost. This entry was posted in Endlessly Green and tagged Aerobic composting, Agriculture and composting, community composting, composting. Bookmark the permalink. 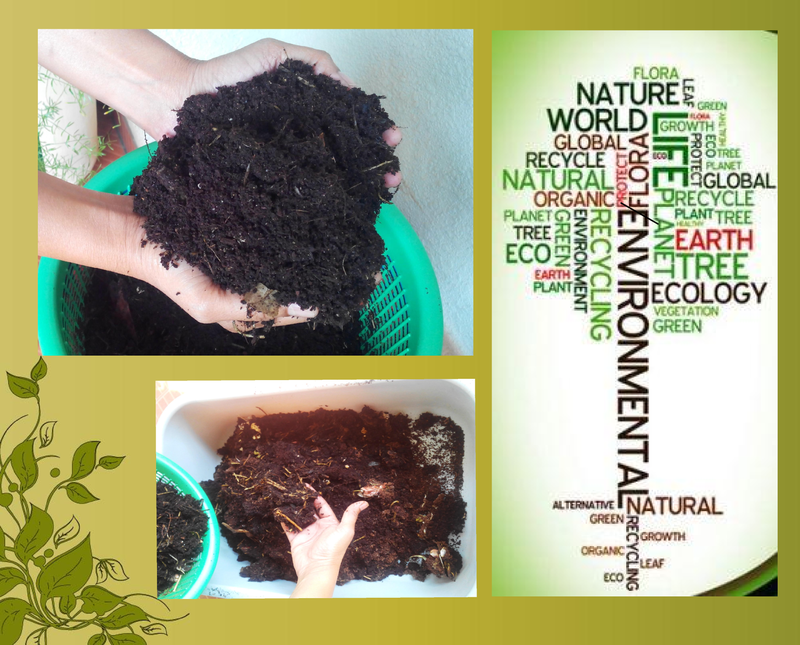 ← My own home composting experiment: It’s harvesting time! Hi, Savita. Just thought I’d drop you a line to say I admire and am inspired by your zest for learning, digesting and writing about “eco” stuff. I’ve had modest success with composting, have recently bought what the Daily Dump calls a “mota lota” and am now looking forward to some regular, organised composting. And the whole deal feels – well, terrific. Yes. I learned that. And it is good to have those two words reiterated. (I remembered it coz a papaya plant had sprouted in a crowded patch in our garden and we transplanted it in a nearby empty area wherein I added home-made ‘gobra’ smelling of the earth. Can’t believe I am hearing these words from you, Jay! You and “gobra”? 😉 Nice to see you taking a short break from your (wide-spectrum) concerns on fellow humans. 🙂 Have a great day! You are precise and clear in your writing. Your passion for sharing information and knowledge is really great. Thank you.